Manipur footballer S Ranjana Chanu of Assam Rifles. Image courtesy: Twitter @official_dgar. 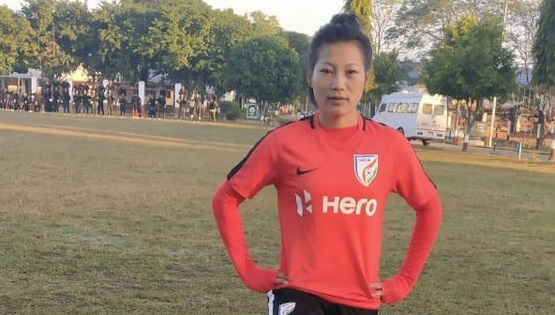 Manipur footballer S Ranjana Chanu of Assam Rifles has again been selected in the Indian Women Football team and as a part of the team, is playing a match against Indonesia. It is to be noted that the Indian Women Team is gearing up for selections of qualifier match for Olympics. Chanu had earlier participated in the first round of the AFC Women’s Olympics Qualifying Tournament in Myanmar, has now been selected for the second round of the Women’s Olympics Football 2020 to be held in Japan. The Indian women’s football team, which also includes Assam Rifles’ Ranjana Chanu, qualified for the Olympic Qualifiers second round last year for the first time, despite going down to hosts Myanmar 1-2 in a hard-fought clash at Yangon. The second round of the Olympic Qualifiers will be played in April next year in Japan.